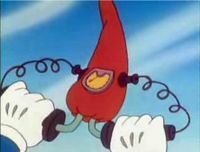 The Red-Hot Pepper Detector is a large, red, and pepper-shaped device owned by Mario in The Super Mario Bros. Super Show!". In The Super Mario Bros. Super Show! episode "Love 'Em and Leave 'Em", it is Mario's Red-Hot Pepper Detector that alerts him that a large patch of hot peppers is nearby; the contraption also leads Mario, Luigi, Princess Toadstool and Toad to that hot pepper patch. Where Mario obtained the Red-Hot Pepper Detector is never explained, how the device works is never told either; though it seems that if any hot peppers are nearby, the Red-Hot Pepper Detector will begin to vibrate and beep, alerting anyone nearby to the fact that it senses something. This page was last edited on February 18, 2018, at 01:12.